Google boss Sundar Pichai joined members of his executive team on his first visit to Nigeria as the company launched YouTube offline for Nigeria to help users save on data costs. “What a great honour to have had our CEO @sundarpichai join us for #GoogleforNigeria today,” it tweeted via its verified handle @googleafrica. 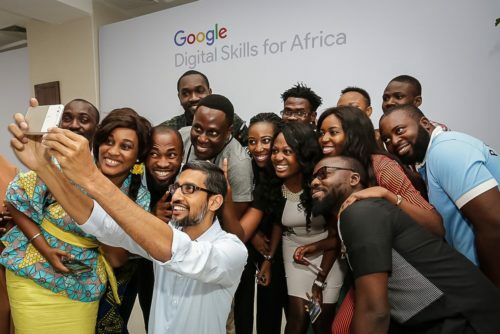 Pichai who announced a series of products for the country, including YouTube Go, a platform where users with slow Internet can preview and save videos, also announced plans to train 10 million Africans. This means that YouTube users in the country can now download any video in a range of different resolutions so that they can watch it later without an Internet connection. Although, the cost of data is expensive and at times the Internet is very slow, Nigeria, with about 93 million mobile Internet users, making it the highest in Africa, is the second country after India to have the YouTube Go capability. According to Google, owners of YouTube since 2006, the number of hours of video content being uploaded in Africa has doubled for the past two years, while viewing time on mobile phones is grown 120% year over year. According to Caesar Sengupta, Vice President of product management, Google will also launch a partnership in September with Japanese mobile manufacturer Freetel to provide 13,000 Naira (about $40) Android phones for the country. Another feature that was launched for Nigeria was the Lagos Street View. Imagery of 10,000 kilometres of Lagos roads, including Eko Bridge, Carter Bridge and the National Museum, are now available on Street View. The tech giant is also set to launch Google Impact Challenge in Africa in 2018 as innovators from non-profits will be able to share ideas on how they can impact their communities and beyond. “We ask non-profits from around Africa to nominate the best ideas and we allow local people to vote for what they think is the best idea. Nongovernmental organizations nominate themselves and people get to vote and choose where the funding goes to,” announced Pichai.